Nativity scenes don’t come much more authentically staged than the one recently photographed in Greenwood, Steuben County. 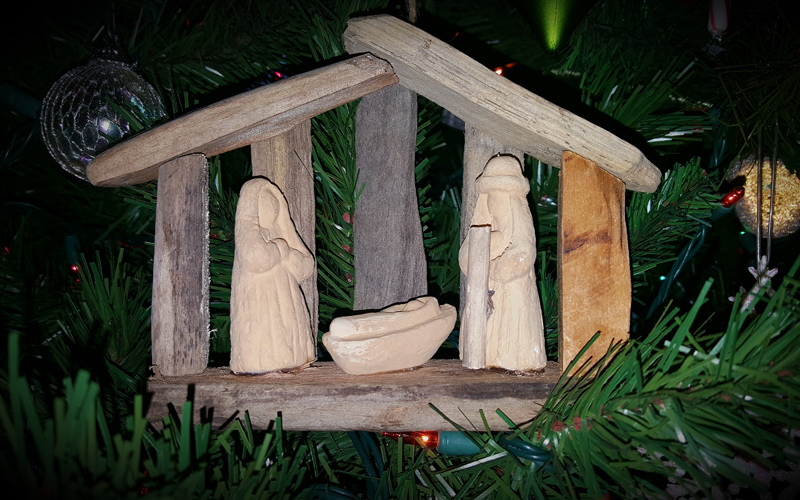 Features included straw on a barn floor, cows in the background, angels prayerfully looking on, a wooden manger, and — at the center — the baby Jesus as portrayed by Keira Crooker, who was less than two months old at the time the photo was taken. Chalk up this stirring scene to the creativity of Alison Mills, 11, who snapped the picture. Her effort emerged as the first-place entry among 11- to-13-year-olds in the Catholic Courier’s diocesanwide 2018 Christmas photo contest. Alison used her family connections to arrange the winning photo, which was taken Nov. 25 at the dairy farm of her grandparents, Kerry and Betsy O’Brien. Baby Keira, who was born Oct, 5, as well as her sisters Rebekah, 6, and Fiona, 4, are all cousins of Alison, as is Evelyn McKeown, 4. Rebekah, Fiona and Evelyn posed as angels surrounding Keira, as did Alison’s sister Amelia, 7. The Mills, O’Briens and McKeowns all attend St. Mary Church in Rexville; the Crookers attend both St. Mary and St. Catherine of Siena in Addison. This marks Alison’s second consecutive win in the Courier’s annual photo contest; she also won in 2017’s 10-12 age category for another outdoor Nativity photo at her grandparents’ farm. That year, Evelyn, Amelia and Fiona also served as angels praying in an outdoor setting over swaddling clothes but no visible baby. However, shortly after Keira was born this past fall, Alison got the idea of incorporating a real infant and the barn setting into her second Nativity effort. And that’s not all. Alison and her mother, Erin, teamed up to create wings that graced the angels’ white dresses. The banner proclaiming Gloria in Excelsis Deo!, held by Amelia and Rebekah, has belonged to the O’Brien family for several generations; and Erin Mills noted that her mother, Betsy O’Brien, uses the manger in which Keira lay for outdoor Nativity scenes every year. Alison said it took about 30 minutes to get everybody into proper position on the day of the photo shoot, with Keira in particular having a bit of a difficult time. “She cried a lot, but we finally got her not to cry. My father (Nicolas) and I held her until she calmed down,” Alison recalled. Her mom said that Alison was definitely the creative force behind all aspects of the photo. Alison said she’s receiving positive feedback from family members as well as fellow parishioners at St. Mary Church. A notice of her first-place showing appeared in the Jan. 13 parish bulletin, and the picture is displayed inside the church as well. St Mary, located in the southwestern corner of the Rochester Diocese near the Pennsylvania border, is part of Our Lady of the Valley Parish along with St. Ann in Hornell. “Everybody (at church) complimented me on it,” Alison said, adding that “I thought it was pretty cool” to win the Courier photo contest two years in a row. Alison said she enjoys photography as a hobby, noting that she especially likes taking aerial photos while riding a plane with her dad, who holds both private and commercial pilot licenses. “I just like taking pictures of things that look cool, that look interesting to me,” she said.